CurlyGirlJess and LouLouMatou are two of my favorite YouTubers. They've been mixing their Curling Souffle with other products to make it work for them. After watching a few of these videos and being beyond bored with my current products, I decided to give it a try. Note that I have the old formulation, but from what I've seen, the new and old perform similarly. 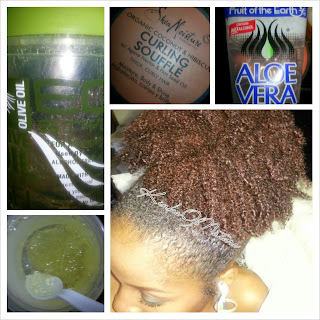 I recently posted the above photo on Instagram of a gel mix comprised of Eco Styler Olive, Shea Moisture Curling Souffle and Fruit of the Earth Aloe Vera Gel (3:2:1 ratio respectively). It's a nice mix! The hold isn't as strong as Eco Styler Olive alone, but it does provide a medium hold. I could smooth my edges and not have that rock hard feel that Eco sometimes gives. My wash-and-go had decent definition. I did a cold rinse after applying the gel mix. Once my hair dried, there wasn't a waxy residue, which is often the case with the Curling Souffle. I used this mix solely for about a week and a half. Towards the latter part part of that time frame, I wore puffs and buns reapplying the gel to my edges each morning to get a sleeker look. There was no buildup or flaking. When the top layer got too frizzy for my liking, I smoothed in more gel. As it was drying, there was a waxy residue, but that dissipated after the first day. My hair felt soooooo soft and moisturized while using this mix. I didn't moisturize and seal everyday. Every other day, I'd take my bun or puff down to tighten it. Each time, I was shocked at how good my hair felt. It'd been raining the entire week so I think the overload of humectants worked in my favor. I like this mix and would certainly do it again. I finished my 32oz of Eco Olive while making the last batch so that won't happen anytime soon though. All of the mixes and photos will be posted on Instagram before I write the blog posts.